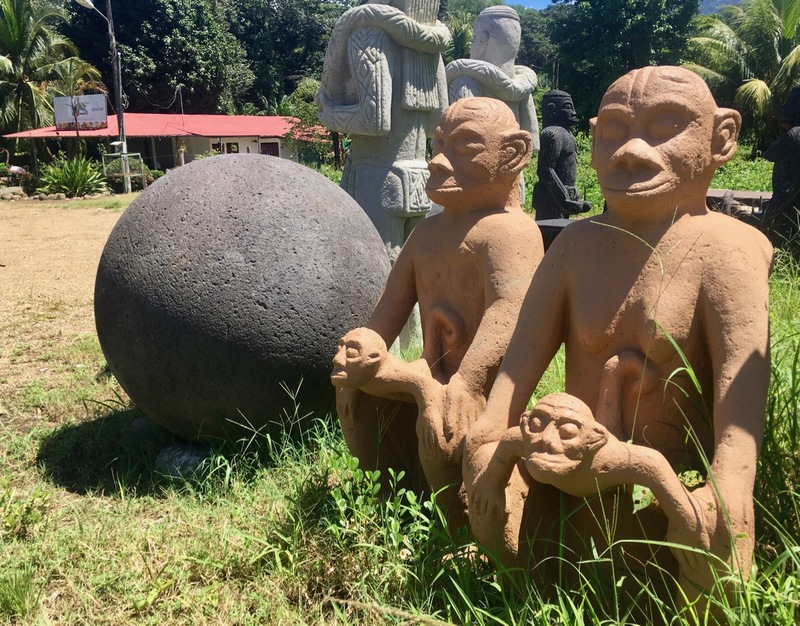 One of the sights along the coastal highway: monkeys and a replica (I think) of on of the stone spheres pre-Columbian people carved here in Costa Rica. There are several places that feature stone carvings like these along the way. Her look says it all. It’s a mix of confusion and concern. Clearly, this Gringo is loco. ¿Piel de topo? she repeats incredulously, perhaps hoping she misheard. But the fact that this Tica pharmacist speaks English spins me instantly in another direction, away from my need for moleskin to thwart that nasty blister my hiking shoes have imposed on my heel. “Is it possible to fill this prescription? 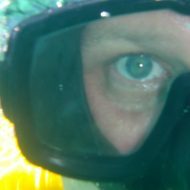 And if so, what would it cost?” I ask in Gatling gun English, digging around in my bag and fishing out a prescription for Flovent that my doctor in Ohio wrote. “It’s for asthma,” I tell her, thumping my chest and breathing deeply. She doesn’t need the sign language. Her English is excellent. While she types on her computer, I think about the moleskin. They must call it something else here. I hope she doesn’t think I’m trying to buy the literal skin of a mole. What next? Eye of newt? She smiles. Moleman isn’t as crazy as she thought. I had my doctor write prescriptions for my asthma meds so I could check pricing here in Costa Rica. The cost at my local CVS in Athens is batshit, and I’m hoping to save some money. To that end, I’ve been ordering my drugs through a Canadian operation that imports them from New Zealand, among other places, at massive discounts. Not sure if it’s legal. Don’t care. I’m so disgusted with the greed-based U.S. healthcare system I’ll commit any crime to stick it to the man. Soda La Jungla, a small onle-in-the-wall restaurant that’s next door. These types of restaurants are called sodas here, offering local dishes at reaasonable prices. Today was another adventure day. 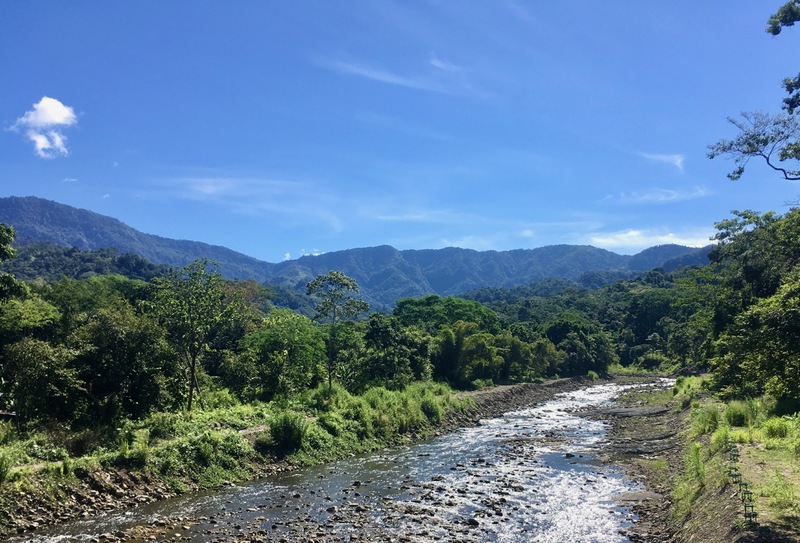 I decide to hike all the way to my new favorite liquor store, which is north of where Rio Uvita flows under the coastal highway. I start with a traditional Tico breakfast at Soda La Jungla, right next door to PurUvita. Two eggs. Fried plantains. Gallo pinto. Coffee. For about four bucks. It’s one of the few bargains I’ve found here. Overall, prices are very comparable to the States, often higher. Some of that clearly is logistic. Some of it is the inflationary pressure caused by a bunch of Gringos — and other non-Ticos — flooding the area. The gallo pinto is good. It’s basic rice and beans designed to fill you up and send you on your way. I had been wanting to stop at this soda (a small, traditional Costa Rican hole-in-the-wall restaurant). Today I was determined to do that. It doesn’t hurt that the place is empty at 7:30 a.m. If I make an idiot of myself, there’ll be no one here to cluck and laugh at the dumb Gringo. I’m going to make this place one of my regular haunts. 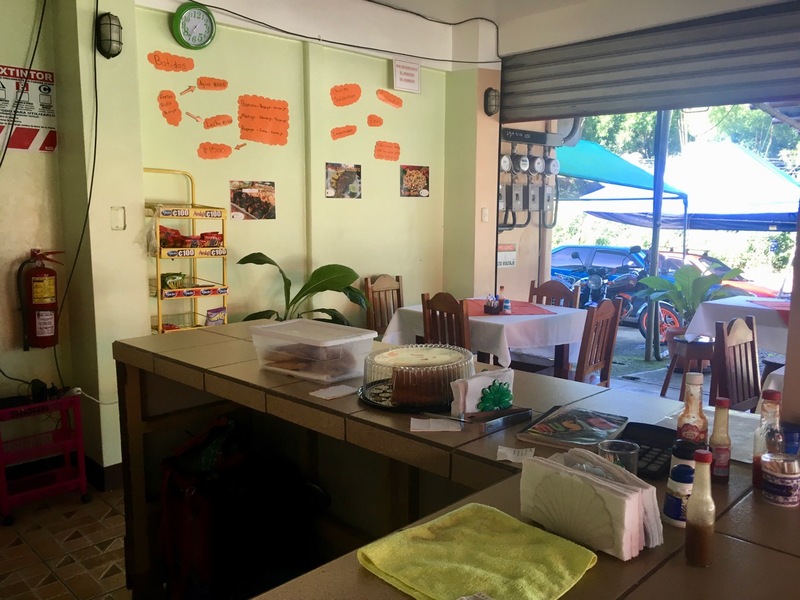 They also have an array of lunch dishes, including ceviche, a Peruvian delicacy that Costa Ricans have adopted whole-heartedly. Raw fish “cooked” by soaking in lime juice and spices. Perfecto. Breakfast at Soda La Jungla. Nothing fancy, but it was four bucks and filling. 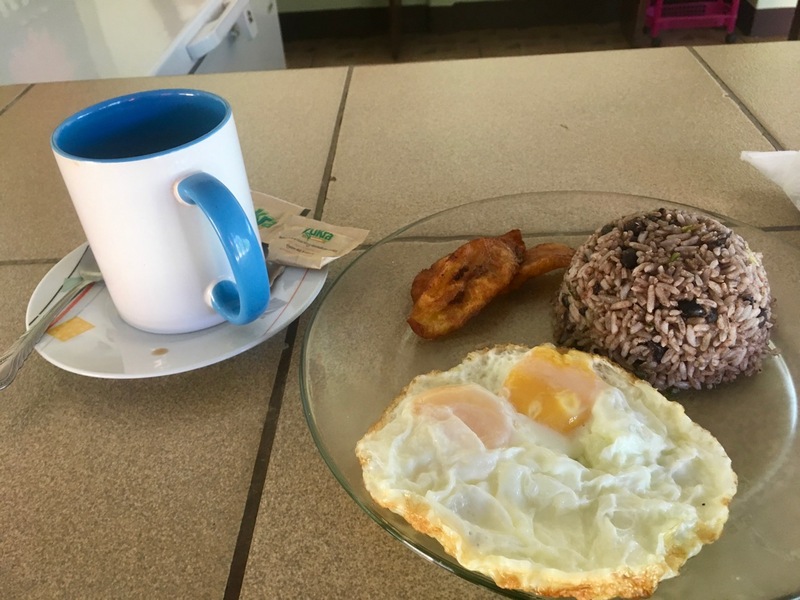 Fried plantains, two fried eggs, gallo pinto (beans and rice), and coffee. From the soda, I waddle off down the highway in search of batteries, moleskin, groceries, etc. I also intend to hit the Saturday farmer’s market, where my new friend, Italian expatriate Sara, is selling her bread. I pick up a ciabatta and another loaf of bread and ask how Gian is doing. Jeff introduced me to Sara and Gian before he returned to the States and I liked them instantly. Gian and I share Pittsburgh and Destin connections. After putting the bread in my backpack, I walk over to the market, where I talk to a Boruca woman selling gorgeous carved masks. The one that catches my eye is a devil. Easily worth the $80 U.S. she’s asking, but worry about carrying it home and ask if she is here every week. Like me, she’s not a native Spanish speaker. Her native tongue is the indigenous Boruca. But through a series of workarounds we manage to communicate in a mix of Spanish, English and gestures. 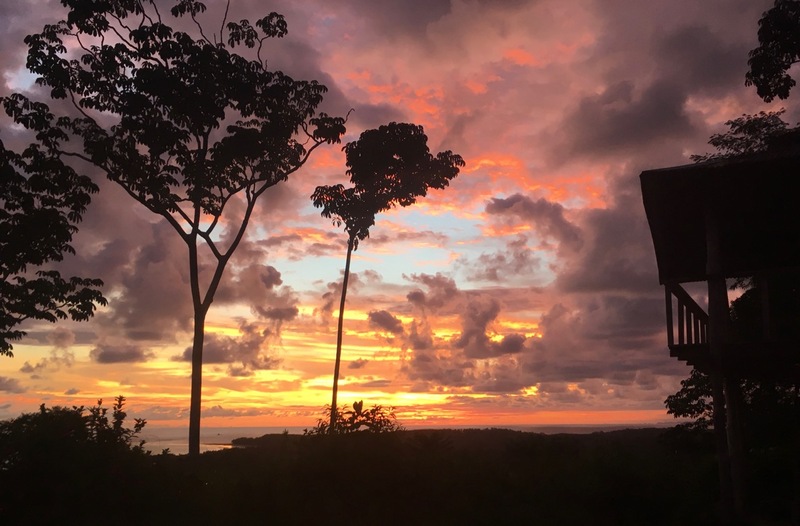 The rainy season makes it difficult to get to Uvita from her remote home, so she’ll probably be here less frequently as the rains become more prevalent. I decide to risk it and wait till later. I suspect I can catch her next week or the following. I really want that astounding devil mask. In retrospect, I should have coughed up the 80 bucks and figured out how to get it home in one piece. I also manage to procure a bottle fo Flor de Caña rum, AAA batteries, eggs, cheese, organic carrots and fresh-squeezed orange juice that was crying to be mingled with that rum. Rio Uvita as seen from the bridge on the coastal highway. The hike home isn’t too bad, though as always the climb to PurVita at the end is a sweaty slog. In all, I log about 10k steps, or 4 miles. I walk that daily at home with Sunny the Great Pyrenees, but the humidity here is soul crushing. Thankfully, today is clear and not too humid. And maybe I’m starting to acclimate a bit. Despite that, I still need siesta in the afternoon to cover from the morning adventure. That siesta is spent in a hammock, finishing Poilu, Louis Barthas’ World War I memoir. What an incredible story. This French barrel maker survived the Somme, Verdun and four years of bloody engagements. The book wavered between boring stretches of logistical details and riveting stories about soldiers who were “turned to marmalade” by bombshells falling in torrents. My evening vespers are a perfect finale to a perfect day. While we had a stretch without water again today, it didn’t darken my mood the way it did yesterday. I knew the water would come back on. I had faith. And in the end, hay aqua. I walk up to the shack a bit earlier than usual, expecting the relatively clear skies to put on a show. I’m not disappointed. Perhaps the best sunset yet. Sol’s last gasp sprawls across the Pacific while flashes of lightning erupt behind me in the east, creating the impression that someone is vainly trying to take flash photos of day’s fleeting final sigh. I think this is my favorite sunset so far. I had a hard time choosing from the photos I took. That’s the silhouette of the shack on the right. As the darkness deepens, an insect hum rises out of the jungle. Birds call out one final time like a child demanding a glass of water to delay the inevitable death of day. I hear music in the distance, probably one of the bars down on the highway, and fireflies bubble up from the weeds.